Place 1 agenda counter on High-Risk Investment when you score it. click, hosted agenda counter: Gain 1credit for each credit in the Runner's credit pool. "Trust me. I know what I'm doing." After 4 months since Order & Chaos came out this is my go-to 3/5 Weyland Agenda which replaced good old Priority Requisition. At its core it serves the same role as PriReq, giving you money, but is much more flexible. It can give you enough money to trace and kill 3-card runner with SEA Source + Scorched Earth combo. It can give you enough money to secure Ash 2X3ZB9CY trace in scoring remote. I used it to gain 5 creds and kill runner, I used it to gain 27 creds to crush his dreams about stealing something from my Ash server. It's bonkers even with only one token, Titan Transnational: Investing In Your Future makes it just crazy. Priority Requisition is good when you are running ICE like Archer which is not as good as it was since all the Faerie, D4v1d and Switchblade are spoiling the Weyland fun. You must use PriReq right away which often may not be the perfect moment. High-Risk Investment gives you more control and I like its burst more then Government Contracts 4 per 2. High -Risk Investment assures credit parity with the Runner in a given moment and is easily rushed in its faction. More than that, it's a powerful credit gain on its own, specially against those decks in which that credit gain is needed the most. 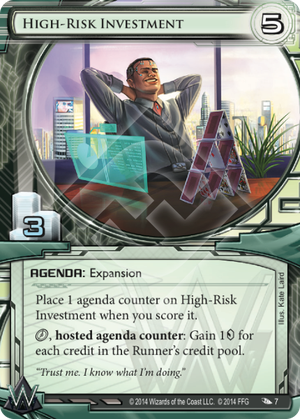 In a sense it's a card that gives continuity: It allows Weyland to keep pressuring the Runner after spending 5 credits and 6 clicks scoring it and pairs well with the very own cards that allow it to be scored, namely Corporate Troubleshooter and Scorched Earth. BWBI: Extends the middle stage of the game that normally BWBI struggles to compete in because its economy cannot keep up. Titan Transnational: While possibly uninterested in running 5/3s, the possibility of gaining twice the amount of credits the Runner has without any Bad Publicity is insanely poweful. Many Titan builds will see a second pillar around this very card.